Paul McCartney Hints His New Album Will Have a Song About Donald Trump. Beatles Radio: The Beatles, Solos, Covers, Birthdays, News The Fab 4 and More! Paul McCartney may have something to say about Donald Trump on his forthcoming untitled album, according to the Liverpool Echo. During a visit to students at the Liverpool Institute of Performing Arts last week, the paper reports that McCartney told the students, “Sometimes the situation in the world is so crazy, that you’ve got to address it." The Liverpool Echo says the song he's written will pertain to President Trump. Billboard reached out to McCartney's reps for details. McCartney is a co-founder of the institute, also called LIPA, and was a student there when it was known as Liverpool Institute High School For Boys. The high school closed in 1985 and reopened as LIPA after an extensive renovation. 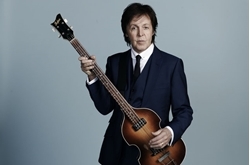 McCartney is the school's Lead Patron. He didn't elaborate further on the song according to the report, but given some other recent comments he has made, Trump and his followers probably won't be a fan of the song. In an interview with the Australian newspaper the Daily Telegraph published at the beginning of July, he told writer Cameron Adams, “I'm not a fan at all. He’s unleashed a kind of violent prejudice that is sometimes latent among people," he said.